Heading to Indonesia and searching for something that is completely unique and extraordinary? Well, make sure to check out the popular Blue Fire Ijen Crater Tour that offers you such unforgettable experience within your journey in Indonesia. What is it again, blue fire? Don’t get surprised. It’s something that you can surely anticipate as you decide to head to Ijen Crater. Located in Banyuwangi, a city in the eastern part of Java Island, Ijen Crater is famous for its blue fire. So, how comes there is blue fire in the crater? Well, Mount Ijen is actually an active sulfur mine situated within volcanic crater and the evasion of sulfuric gases that burn a dazzling iridescent blue. We cannot deny that it is extremely phenomenal! To discover Ijen Crater is something tricky. It will be absolutely recommended for a first-time traveler to visit with a guide for safety. Even though it is basically possible to go without tour, coming here with a tour is far more ensuring. Then, how can we find the best provider for our Ijen blue fire tour? Here are some points that you can use as consideration when selecting a tour for your Ijen Crater trip. You really need a professional if you want to have the best and safest tour at Ijen Crater. It’s sad that some of the visitors get seriously injured when they are here. However, if you go with a professional and experienced guide, there is no doubt that you will be 100% fine. It’s highly essential for you to consider about the inclusion that is offered by the tour provider as well. Ijen Crater tour packages are not creating equal. Some may have the same features while other not. That’s why it is a good thing for you to learn about what is included to your tour and what is not. Then, you can also consider about the rate of the package offered by the tour provider. There is carrier that offers a tour of IDR 150.000 per person for a minimum two person in the pack. If you consider taking the one that goes with other destinations, the price can be different. For instance, you may think of choosing a tour that combines Mount Bromo tour and Ijen Crater tour to get the most of your adventure in Indonesia, for sure you will need to pay more for this kind of tour package. So, what do you think? 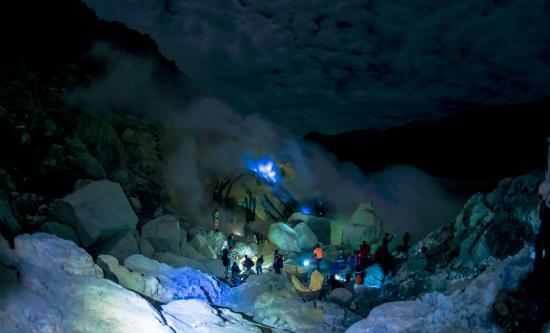 The blue fire of Ijen Crater is worth a peek, isn’t it? To make sure that you choose the right Ijen Crater tour, here we recommend you to visit www.jogjabromotour.com to find your very best tour package. Here, you can also discover various fun tour packages around Yogyakarta, Mount Bromo and Mount Ijen. Finally, have fun!